Energy security then must ensure that at every instant generating capacity meets demand, otherwise we have blackouts. Moving from fossil fuels to wind power threatens energy security because it increases the likelihood of a shortfall in supply. Such an event occurred last December (2012) at 5pm when with peak demand at 56 GW – All of UK ‘s wind turbines delivered essentially nothing (<0.1GW). Doubling the number of turbines to 10,000 would have made no difference whatsoever. Since then several coal stations have closed and energy security has diminished. 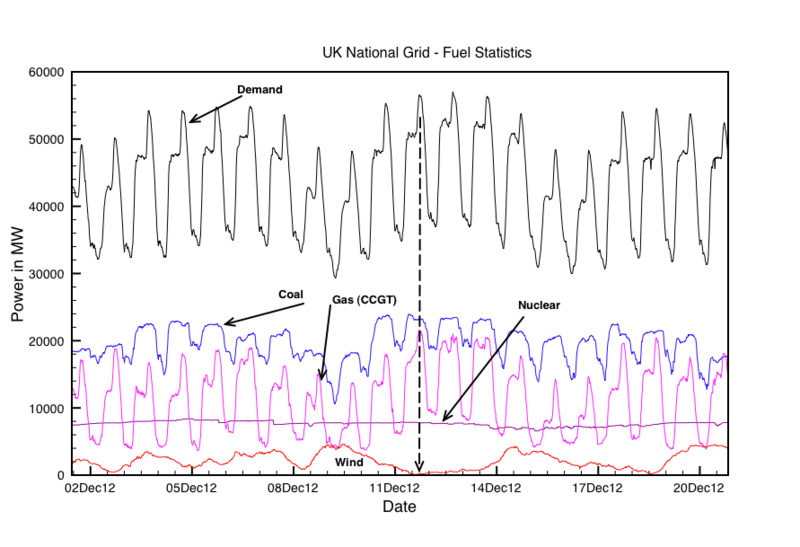 Detail of power demand and generation by different fuels. On December 12th at 5pm wind power dropped to 70MW or 0.01% of demand. Gas and coal reserve capacity compensated. The risk of blackouts increases as fossil reserves fall and wind increases. The recent Channel 4 program “blackout” shows how quickly society collapses during any extended blackout. DECC beware ! An over-reliance on wind power will increase the likelihood of blackouts. The only way out would be to store huge amounts of energy cost effectively and this is highly unlikely. There are just not enough mountains in the UK for pumped hydro storage. This entry was posted in Energy, renewables, Science, Technology, wind farms and tagged energy security, wind power. Bookmark the permalink. Do the jet pack updates work ? The comments do but the subscriptions to new posts don’t. Why?